Citizens Commission on Human Rights presents shocking evidence of abuse affecting the people of Toronto. TORONTO, September 27, 2018 – Those touring the “Psychiatry: An Industry of Death Exhibit” at Toronto Reference Library were presented documentation of long-term abuse in the field of mental health. 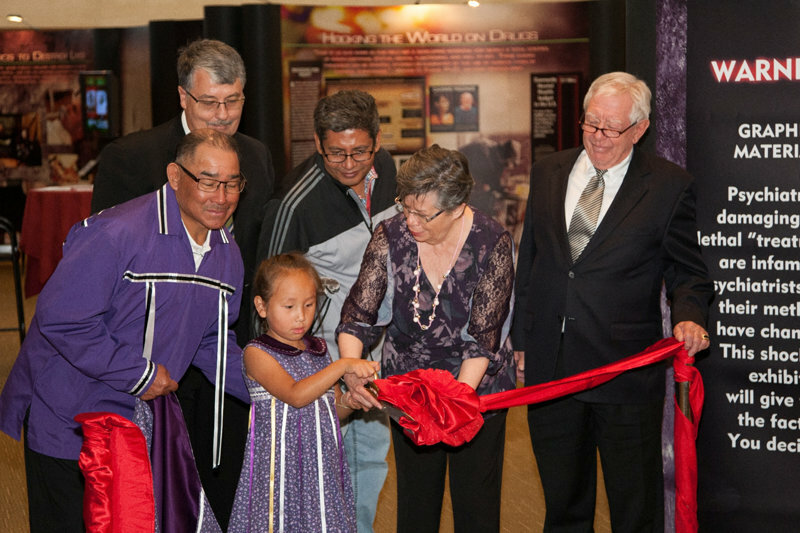 As Toronto is located on historic First Nation lands of the Huron-Wendat and Petun First Nations, the Seneca, and the Mississaugas of the New Credit First Nation, CCHR invited a member of the Onondaga Clear Sky Wolf Clan and his five-year-old granddaughter to cut the ribbon, signaling the opening of the exhibit. They were joined by a representative of the Church of Jesus Christ of the Latter-day Saints and the Church of Scientology. Each year, millions of prescriptions of psychoactive drugs are dispensed to Canadian youth under 18—drugs that have never been tested on children. Awakening visitors to the danger of this practice, the exhibit presents compelling evidence of the direct relationship between psychiatric labeling and drugging of children and child suicides and school shootings. By reading the panels and watching the documentary on the exhibit’s video screens, visitors gained a historical perspective of psychiatric human rights abuse that continues to today, such as forced commitment and the use of electroshock on seniors and children. In the documentary, more than 160 health professionals, doctors, psychiatrists, psychologists, academics, legal and human rights experts and victims give firsthand accounts of psychiatric brutality. Videos trace the origins of psychiatry, its oppression of blacks, indigenous populations and other minorities, the roots of eugenic sterilization of “unwanted populations” and the pivotal role psychiatrists played in the Holocaust. People touring were invited to sign a petition requesting a searching investigation into the field of mental health and its promotion of dangerous drugs. With headquarters in Los Angeles, California, CCHR International guides a global human rights advocacy network of some 180 chapters across 34 nations. CCHR Commissioners include physicians, psychiatrists, psychologists, lawyers, legislators, government officials, educators, and civil rights representatives. For more information on CCHR Canada call (647) 784-9130, email [email protected] or visit the website of CCHR International.